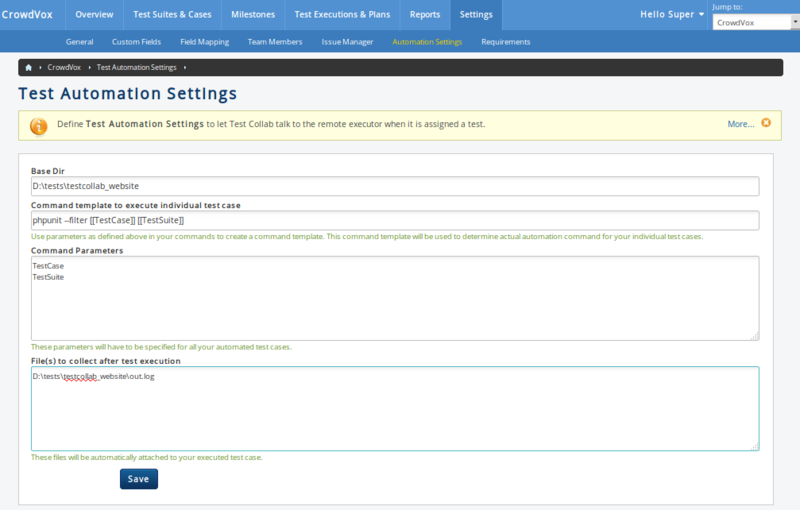 This is the second step that needs to be followed to configure test automation for your Test Collab project, the first step that requires configuring the remote executor is explained here. Navigate to "Settings" > "Automation Settings" when a project is selected. Base Dir The directory that would serve as base directory from where the automation tool needs to be invoked. 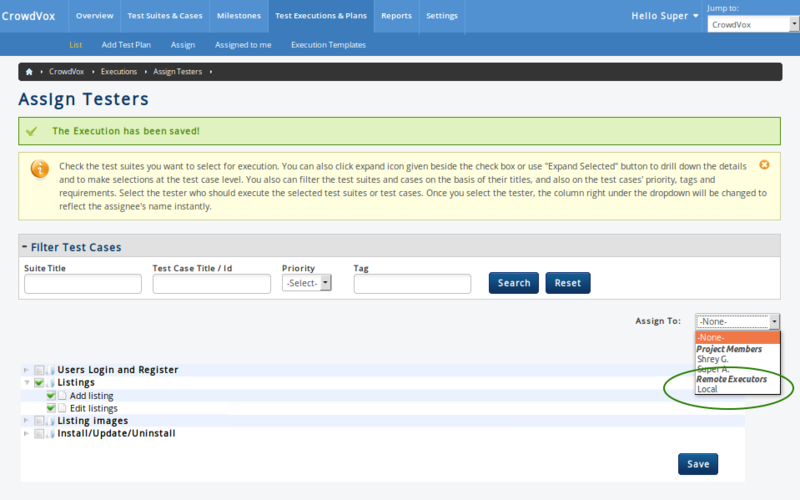 This can be treated as the working directory for test automation tool. Command template to execute individual test case The template that includes actual command to invoke the automation tool along with its parameters. The parameters need to be separated by white space and must be enclosed within a set of two square brackets. Command Parameters The list of command parameters in a sequence in which they should appear with command. This list will be used while automating individual test case. File(s) to collect after test execution These files will automatically be attached to your executed test case. So you should specify the absolute path from where the file(s) need to be fetched. Once the automation settings for a project are in place then you would see "Automate" option for the test cases that come under the project. When "Automate" option is selected, you will be given an option to provide test case wise parameters that should be passed to the command (refer template above) that invokes test automation tool. Individual parameter will have its own entry box to provide the value for. Having done with the configuration and automating individual test case, you can now easily assign the test cases to the "Remote Executor" machine so that it can in turn invoke your test automation tool with command and its parameters that are included while configuring. Please Note: For the test status, we rely on exit code of the process. Exit code = 0; means test is passed, any other code means fails. Besides this, all the output generated by the process is captured and uploaded as well.